Vada Sultenfuss: I was born jaundiced. Once I sat on a toilet seat at a truck stop and caught hemorrhoids. And I've learned to live with this chicken bone that's been lodged in my throat for the past three years. So I knew Dad would be devastated when he learned of my latest affliction. Vada Sultenfuss: Dad, I don't want to upset you, but my left breast is developing at a significantly faster rate than my right. It can only mean one thing: cancer. I'm dying. 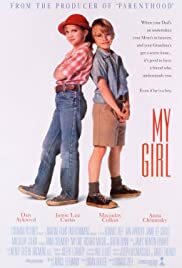 'My Girl' is a rare treat in that it is a moving family drama that never descends into being overly-sentimental or cloying in the messages it's trying to deliver. It is a very bittersweet look at the joys and tears a girl faces when she stands on the cusp between childhood and adolescence. Set over the summer of 1972, the film centres on Vada Sultenfuss, a motherless eleven-year-old tom-boy who has enough problems coping with impending adulthood on top of having to contend with her oblivious mortician father Harry and her senile grandmother Gramoo. And if things were not bad enough, Harry hires an assistant in the form of the funky Shelly leaving Vada feeling her place in her father's life is threatens by this new woman. Thankfully she is not alone as seeing her through her troubles is her loyal best friend Thomas J. While Dan Anckroyd and Jamie Lee Curtis, as Harry and Shelley respectively, were great in their roles as two adults who both care for Vada and who have a growing attraction to each other, it was the child actors who stole the show. Anna Chlumsky, in this her film debut, delivered a first class performance as Vada, depicting the all the little nuances of the character from the confusion a tom-boy feels as she tentatively embraces her girly side in deference to her first crush to the desolation of bereavement to the loneliness she feels due to her father's thoughtless neglect. She was excellent in showing Vada's childish innocence and rare maturity that comes when a child has dealt with the harsh side to life. Macaulay Culkin was another surprise as he portrayed the guileless Thomas J. It was a pleasant change to see him in a role other than the obnoxious kid he usually depicted in previous films such as 'Home Alone' and 'Uncle Buck', and he rose to the occasion with flare, perfectly displaying the bumbling but sensitive and caring nature of his character. His performance here proves that, had he chosen to, he could have been one of the rare few who succeed in the seamless transition from being a child actor to a teen/young adult actor. 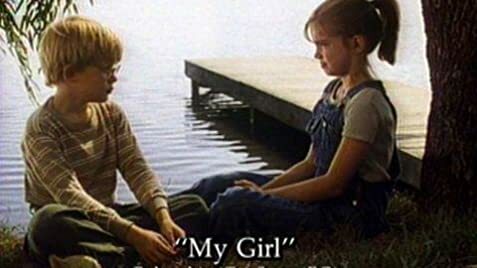 'My Girl' is so involving for a wide age group because it not only conjures up nostalgic memories of summers gone by in adults who occasionally long for the carefree bliss of childhood but it engages younger viewers into considering the lessons of loyalty, love, loss and growing up. It definitely strikes a cord in those who are eleven years old themselves (I was eleven when I first saw this film and felt as if I could identify with Vada on many things). Most girls of eleven will probably empathise with Vada's views that nothing happens to boys! Highly recommended.